The AC Series Air Cylinders are available in diameter ranging from 0.39 – 3.93 in. with stokes from 0.79 – 6.30 in. The units are offered in single action and double action styles and can be operated in 32 – 140ºF temperature range. They are suitable for applications such as polishing machines, surface mounting equipment and high precision machines. The cylinders come with a bed of air surrounding the piston rod that avoids the contact with the air bearing. Schaumburg, IL –AC Series Air Cylinders from Fujikura are uniquely constructed for abrasion-free, smooth movement that results in accurate and long-term operation. A bed of air surrounds the piston rod and prevents contact with the air bearing. Operating with zero friction, the AC Series achieves precise control. In fact, the AC Series’ precise pressure control is not possible with conventional cylinders. The non–contact structure of the cylinder also eliminates dust generation for reduced wear. Fujikura offers the industry’s widest range of cylinder sizes. Standard cylinder diameters range from 0.39 – 3.93 in. Standard strokes range from 0.79 – 6.30 in. 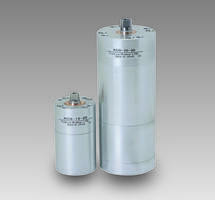 Custom and larger cylinders are available from Fujikura on request and based on customer requirements. To meet the confined space demands of one customer, the cylinder manufacturer even developed a D-shaped cylinder. AC Series air bearings are made of metal material, but Fujikura can manufacture them using materials other than carbon as needed. Orders in quantities as few as one cylinder are accepted. AC Series Cylinders operate with extremely low hysteresis. Single action (push) and double action styles are available. Working temperatures range from 32 – 140ºF and working pressure ranges from 1.5 – 87 psi. AC Series Cylinder applications include polishing machines, surface mounting equipment, high precision machines and other equipment that requires precision tension control. For over a century, Fujikura has been a leading manufacturer of pneumatic components in Japan. The company continues to be based out of Japan, while offering customers in the U.S. complete sales, support and service. To learn more, stop by Fujikura Rubber’s Booth #121491 at IMTS, or visit www.fujikura-control.com/english/ or contact Fujikura Composites, c/o A-Lex International Marketing, 1111 N. Plaza Drive, Suite 755, Schaumburg, IL 60173, Phone: (847) 593-7000.